WASHINGTON (AP) — President Barack Obama said he once had the opportunity to meet with former first lady Nancy Reagan, and she could not have been more charming and gracious to him and Michelle Obama when he came into office. The president spoke about the former first lady on Monday after meeting with financial regulators and advisers. Earlier in the day, he had ordered flags on federal buildings to be flown at half-staff in her memory. Obama said it's well documented the extraordinary love that she had for former President Ronald Reagan and the comfort and strength she provided him in hard times. Obama said he has been lucky to have an extraordinary partner in his life as well. He knows how much she meant to the president and country as a whole. "He was lucky to have her, and I'm sure he would be the first to acknowledge that, so she will be missed," Obama said. White House spokesman Josh Earnest, asked whether Obama would attend the funeral, said officials were waiting until funeral arrangements for the former first lady are settled before determining who will represent the White House at the service. 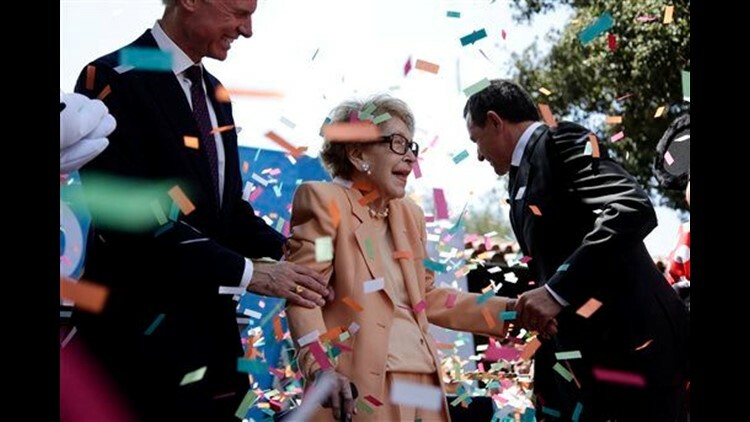 Mrs. Reagan died Sunday at the age of 94.